The Earthquake singer has been riding high on Spotify with the Emeli Sande duet Beneath Your Beautiful - but says number ones aren't his priority. "It's not that important to me. It guess it's important for my fans because they want to see me do well," he revealed. "But for me I'm 100 per cent about the music rather than the positions. Some people are going to love records that I do and some people are going to not feel them as much but that's cool with me." 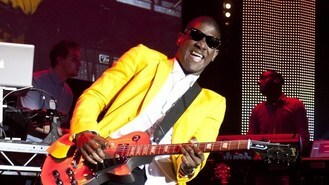 Labrinth - who played an intimate gig for Reebok which was live streamed on Spotify last week - is also keen to make music with X Factor winner James Arthur. The singer - who was seen duetting with James during the ITV1 series - added: "I'd definitely like to work with him, that's my boy. I think James sounds best just with his vocal being the focus. He's got an amazing voice, why would you hide it with loads of production?"